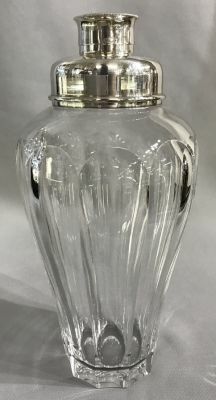 German Art Deco sterling silver and cut crystal cocktail shaker. All three component parts of the silver cover and collar are fully marked with the symbols 925 Sterling, the Half Moon and Crown mark (Germany) and HW. HW is the company mark for Emil Hermann, established in 1921.